“Caribou Lou”, Tech N9ne’s party anthem celebrating one of his favorite drinks, is on its way to being the Kansas City King’s first Gold Single! We are less than 100k downloads away from Tech receiving his first Gold Single plaque and we need your help. To share this experience, Tech N9ne and Strange Music are holding a contest – the winners of which will receive their very own limited-edition, autographed, RIAA certified Gold Single plaque! How do you enter? It’s easy! 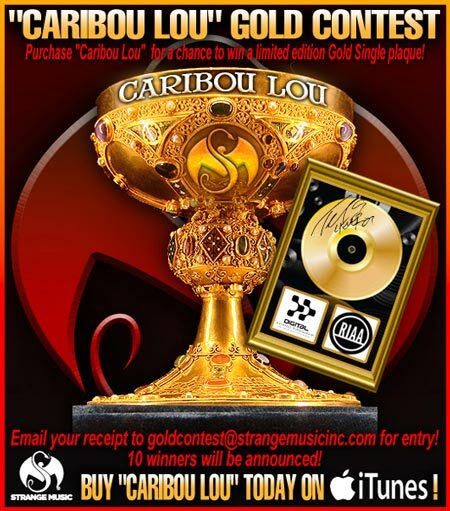 Simply send your “Caribou Lou” song-purchase receipt to goldcontest@strangemusicinc.com (forwarding the purchase confirmation email is the easiest way)! Receipts can be obtained from any music purchasing site or service (iTunes, Amazon, Zune, etc.). Encourage fellow fans to get reacquainted with “Caribou Lou” or introduce the track to your friends who aren’t familiar with it – either way, everyone can help Tech N9ne and Strange Music reach this monumental goal and have a chance to win a piece of history as well! As soon as the gold figure is reached, we will announce TEN lucky purchasers of “Caribou Lou” as winners of their very own limited-edition Gold Single Plaque from Tech N9ne – when Tech goes gold, so can you! Keep it Strange!